Have you ever wanted to improve your own pet photography skills or simply learn about taking better pet photographs? Ever experienced frustration with creating photographs of your best furry friend? 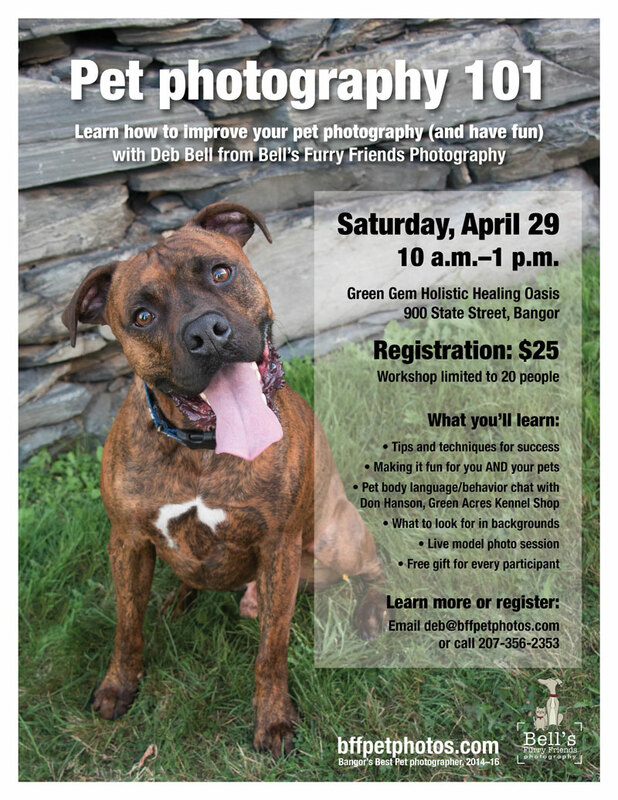 Bangor’s best pet photographer, Debra Bell of Bell’s Furry Friends Photography will be hosting an interactive workshop on April 29 from 10 a.m.-1 p.m at the Green Gem Holistic Healing Center, 900 State Street in Bangor. The workshop will feature a discussion of pet behavior and pet body language with Green Acres Kennel Shop owner Don Hanson, as well as a demonstration on creating pet photographs with live dog models with Deb Bell. Registration is $25 per person and the workshop is limited to 20 people. Registration fee is non-refundable unless the workshop is cancelled.